Ya'll know I love my architecture. Ya'll know I love my museums. In Renzo Piano, I have a double-double! Ask anyone and they'll tell you that Italian architect Renzo Piano is one of the premiere museum designers in the world. I've now seen his work at the Art Institute of Chicago, the Morgan Library in New York, Centre Pompidou in Paris, and the Menil Collection and Cy Twombly Gallery in Houston. Sadly, my timing was off to see the full renovation for the High Museum of Art in Atlanta and the forthcoming work at the Isabella Stewart Gardner Museum in Boston. I've yet to see anything of his that I don't like, but one wonders if it's because I'm just partial to museums in general. 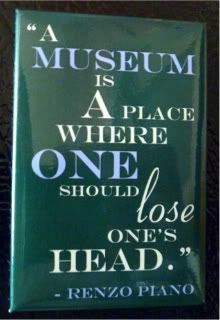 Anyway, I picked this magnet up last week at yet another museum, the National Building Museum here in Washington, DC. Yes, I've been there before, and even blogged about it before, but they have some really great exhibits. Currently, they have the Lego Architecture exhibit that I saw over at Chicago's Museum of Science and Industry a couple of summers ago and a really interesting Palladio exhibit. They also have an ongoing Washington Symbols of Power exhibit, that I wish they'd add a panel to for the WWII Memorial story. But, the piece de resistance for me and this museum right now, is their World's Fair exhibit, focusing on the America's World's Fairs held in the 30s. I rushed through it quickly last week, and then took a docent tour right afterward. But now, I'd like to go back this week to actually take my time walking through it. And that's when I'll actually do the magnet for it. For now, Renzo Piano's words ring true for me - museums for me in the last several months have proven the places where I can definitely lose my head. Wandering around the hallowed halls of knowledge, art and history has been a soothing avocation to my usual daily job hunting. Ha! When I first read the magnet, I was sure that attribution would be to someone like Marie Antoinette. "Lose one's head"? Get it?